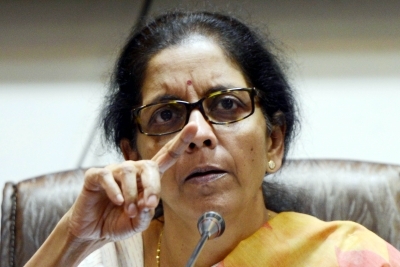 Defence Minister Nirmala Sitharaman on Sunday flagged off Indian Navy’s ‘Navika Sagar Parikrama’, the first ever Indian circumnavigation of the globe by an all-women crew. ‘Navika Sagar Parikrama’ would be covered in five legs with stop-overs at four ports for replenishment of ration and repairs as necessary. The expedition formally launched by Sitharaman is led by Lt. Commander Vartika Joshi and comprises of an all-women’s naval crew, who have trained extensively for the forthcoming voyage. The crew has sailed approximately 20,000 Nm onboard INSV Mhadei and Tarini as part of training, which includes two expeditions to Mauritius (in 2016 and 2017) and a voyage from Goa to Cape Town in December 16. INSV Tarini, a 55-foot sailing vessel has been built by M/s Aquarius Shipyard Pvt Ltd, Goa, and was inducted into the Indian Navy earlier this year. ‘Navika Sagar Parikrama’ would be covered in five legs with stop-overs at four ports (same ports as Captain Dilip Donde called on) for replenishment of ration and repairs as necessary, before returning to Goa in April next year. The first Indian solo circumnavigation was undertaken by Captain Dilip Donde of the Indian Navy. “The project is considered essential towards promoting ocean sailing activities in the Navy while depicting the government of India’s thrust for ‘Nari Shakti’,” a Defence Ministry statement said.